Is It Good? Rick and Morty #5 Review – AiPT! Sometimes misdirection can be a good thing. From surprise parties to mystery filling in your food, being told one thing and getting another can be rewarding. That’s the case with this latest issue of Rick and Morty. Is it good? I don’t know if it’s because the new season started or what but this latest issue is so flipping good I can’t contain myself. 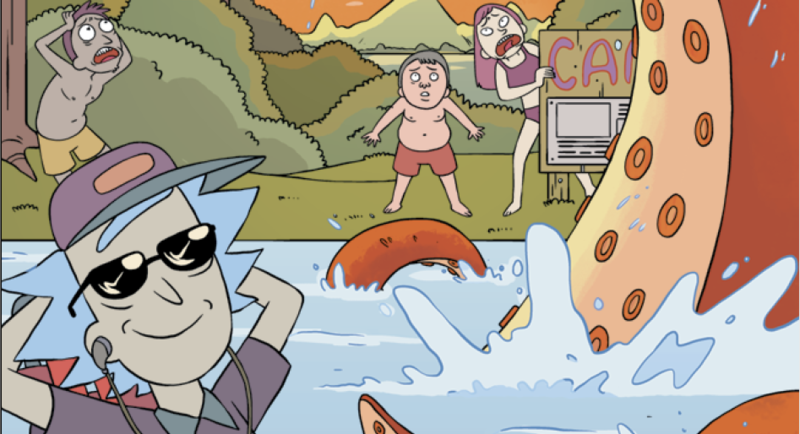 Written by Zac Gorman, this issue opens with Morty going to summer camp and it just so happens Rick is the camp counselor. It sounds like a convoluted setup, but don’t worry because they question it right up front. From there we get Morty wishing to hook up with the hot girl as well as Rick actually trying to be a lifeguard. It’s all wacky, weird and don’t quite make sense. The twist, though, is to die for. Gorman fills this issue with a ton of laughs. There really is all sorts of humor that should attract most folks, from silly dialogue to higher level plot humor. This issue is layered in a very good way to deliver on multiple levels. What’s funny is Morty is the main character here with Rick only appearing once or twice to deliver his quintessential don’t-give-a-crap attitude. Usually when they aren’t together, at least with this comic series so far, it’s a bit of a hiccup and not quite as funny, but it works very well here. I wonder if Gorman was aware of Wet Hot American Summer coming out on Netflix when he wrote this. Or maybe he just has the perfect awkward camper in Morty to stick in a camp and let the humor run its course. Either way, it’s a fantastic location to mine jokes. The art by CJ Cannon is a little more loose this issue and less of a perfectly direct representation of the cartoon. That isn’t necessarily a bad thing as his style gets a little wild and less controlled later, but still interesting and good at telling the story. Well, the early pages are a faithful representation of the cartoon. It’s only later that the lines get a little more wobbly and sketchy. Because of the source material and the nature of the story, though, it never feels off base. The backup – which I’ve taken umbrage with in the past – works nicely and suits the character it focuses on. I can’t give it away; the joke is so short and quick, but it’s a fun one none the less. This is without a doubt the funniest issue of the series yet. It doesn’t go completely bonkers with science fiction, but gives us enough taste to satiate that part of the title. Meanwhile it’s hilarious from beginning to end. Read this!